From years of practice, gem dealers become expert at evaluating the quality of gemstones. However, communicating the quality differences to others requires a language that is fairly exact. You'll often hear gem dealers use terms like luster, brilliance, fire and scintillation. These are technical terms that have quite specific meanings in the gem world. The term brilliance is perhaps the most misunderstood of these terms, especially in the world of colored stones. In ordinary language, brilliance suggests terms like "shiny", "bright", "glittering" and "lustrous." But the term brilliance has a somewhat different meaning in the world of colored gems. The technical term brilliance refers to the light that is reflected from the interior of a gem, not from its surface. For a colored gem such as a blue sapphire or a red ruby, the light reflected back to the eye is colored, not white. In a well cut gem, most or all of the light that enters the stone will be reflected by the pavilion facets and returned to the eye through the crown of the stone. A colored gem with good brilliance will be literally bursting with color from all angles. 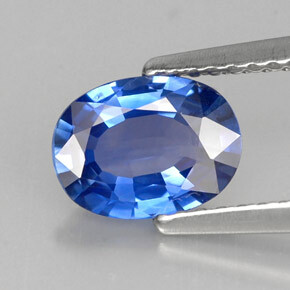 A poorly cut gem will have areas of reduced color and will thus lack brilliance. The lack of brilliance can have several different causes. In some cases, significant inclusions in the gem prevent some light from reflecting back to the eye, and these will appear as dark or cloudy regions in the gem. In other cases the pavilion facets are cut with too steep of an angle, and the light reflected is reduced in intensity and appears dark. This phenomenon is known as extinction. In yet other cases, light passes right through the pavilion and is not reflected back through the crown at all. 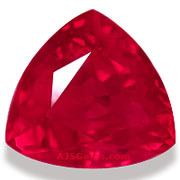 This results in a window or reduced area of color in the center of the gem. The term luster is a simpler concept. It refers to the light reflected from the surface of a gemstone. Where only transparent gems can be said to have brilliance, all gems have luster. In the gems world luster is classified as metallic (gems such as pyrite or hematite), adamantine or diamond-like (such as demantoid garnet, zircon or sphene), vitreous or glass-like (such as sapphire or tourmaline), silky (such as malachite), greasy (such as jade) or resinous (such as amber). A well polished gem, free of scratches, will display good luster; but the type of luster will be determined by the nature of the material.